This is exactly the same as for the entry tickets to the Casa Batlló. 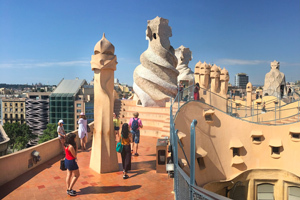 It would also appear, at first glance, that the entry tickets to La Pedrera are quite expensive but satisfaction with the visit is 100% guaranteed. This is truly something that you cannot afford to miss if you want to see the very best of what Barcelona has to offer. This extraordinary building will most certainly astonish you in its entirety but, most of all, for its large terrace on the building's top floor along with all the rooms which are furnished in period style. Buying tickets in advance is strongly recommended as there can be long queues at the ticket office. La Pedrera, which is situated on Carrer de la Provença, is just a stone's throw from the famous Passèig de Gràcia, one of the city's most important streets which is also renowned for being the setting for another architectural masterpiece of Gaudí's, the Casa Batlló. The building's façade doesn't attract attention because of its colour but draws the eye of every passer-by because of its undulating forms and its wealth of wrought iron decorations. A large part of the building is still inhabited but you can visit certain parts of the building such as the terrace, one of the apartments - which has rooms that are decorated with period furnishings and the cellars which adjoin the musuem. When you enter the interior of the building, your eyes will be drawn immediately to the stunning colours on the terrace, the undulating shapes in the museum, the rich decoration on the walls and the unusual structure of the doors - all of which show off the sensational artistic genius of their creator. Deciding to visit La Pedrera entails visiting one of the most beautiful and most famous works by the Catalan architect but it also involves a leap backwards into the history of another period when you see the furnishings and the decorations of another time. It is also possible to visit one of the kitchens which has been preserved as it was originally, including the pots and pans of another era. You will be enchanted by the unique beauty of the the building as well as by the hidden surprises which you will discover on the roof terrace! The other alternative is the "Be the First" option which is perfect for those who prefer the early mornings and a more peaceful experience before the vast majority of tourists arrive. On the day of your visit, show your entry tickets on your smartphone at the entrance to La Pedrera.